With the information out now that the Iron Fist Netflix show not only was still being made, but also had a new showrunner, an old argument resurfaced: that Danny Rand, the Iron Fist, shouldn’t be white. Here, then, are the arguments for a non-white Iron Fist. Iron Fist was first published in Marvel Premiere #15 in May of 1974 and went on for another ten issues before being spun off into his own book. He was created by Roy Thomas and Gil Kane due to their love of kung fu or wuxia movies. Thomas said that he was inspired by a movie where there had been something called the “ceremony of the iron fist,” hence the name he used. There was also the popularity of Bruce Lee films (Enter the Dragon had just come out in 1973), which Marvel had already capitalized on with the creation of Shang-Chi, Master of Kung Fu. The difference between the Iron Fist and Shang-Chi, however, was that the Iron Fist was white and had an origin that used one of Western cultures more insidious tropes: Mighty Whitey. Danny Rand was the son of Wendell Rand and Heather Duncan. When Wendell, Heather, Danny, and Wendell’s business partner went on a trip through Tibet to try and find the mythical city of K’un L’un, his partner betrayed and killed him and Heather sacrificed herself so that Danny could get to the gates of K’un L’un. Inside K’un L’un, Danny trained with the help of Lei Kung the Thunderer and eventually became the most gifted of all of Lei Kung’s students, even defeating the dragon Shou-Lao the Undying and gaining the power of the Iron Fist. This narrative of the white character living among a native population and eventually becoming better than they are isn’t new or unique. In fact, Thomas was inspired by Amazing-Man, a white man who grew up in a monastery in Tibet and was trained by the Council of Seven (the character would later appear in the pages of Immortal Iron Fist). And there have been plenty of other characters with similar origins: the Phantom was a white man who crash landed in Africa and was saved by pygmies and eventually became the Phantom to save them; it’s the same with Sheena, Queen of the Jungle and Tarzan of the Apes. In fact, Shang-Chi was inspired by the television show Kung Fu, which was supposed to be about a character of mixed descent (his father was American and his mother was Chinese), but was played by the very white David Carradine. This, then, is the legacy of the Mighty Whitey: the white character who is shown to be “better” than the native population that he grew up with and/or protects. In fact, this is often paired with another trope: the White Savior Narrative. 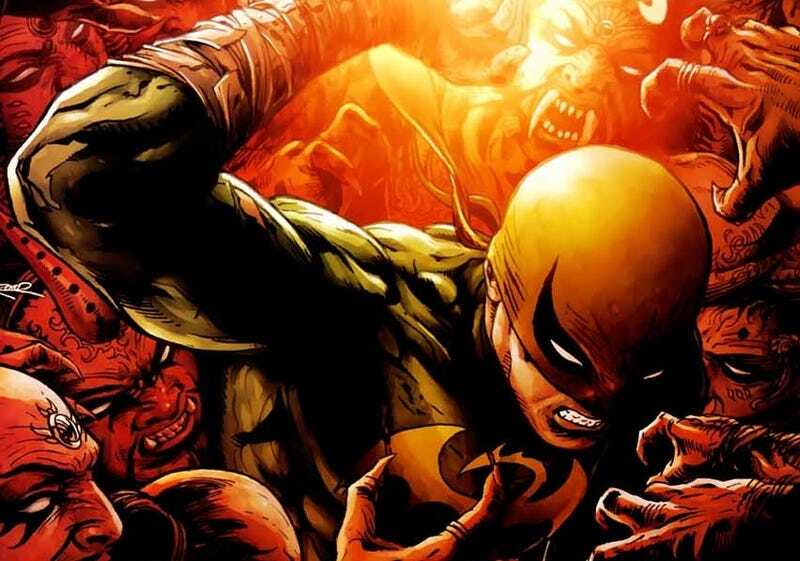 When Matt Fraction and Ed Brubaker began writing Immortal Iron Fist in 2007, they did one very important thing: they showed that Danny Rand wasn’t the best. The Iron Fist was just one of many “Immortal Weapons.” The story also explored many of the previous Iron Fists and how they were different than Danny. This, in effect, swept the “Mighty Whiteyness” of Iron Fist under the rug, instead exploring the concept of what it meant to be an Immortal Weapon. The Netflix show might not be able to pull that off as well as Fraction and Brubaker did. It’s a hard thing to do to subvert a long-standing trope that has been steeped in racism. But one way to do that is to change the narrative: change Danny’s race. Many people are calling for an Asian-American Danny Rand. Why Asian-American? Well, the number of Asian characters in the Marvel Cinematic Universe is severely lacking: there have been zero main characters who have been Asian and of secondary/minor characters, only four (Yinsen, Hogun the Grim, Jim Morita, and Helen Cho). Of the television shows, only Agents of SHIELD is better, with two main characters who are Asian-American, but all of the other shows have zero Asian main characters.